Breaking new ground in scholarship on gender and politics, Performing Representation is the first comprehensive analysis of women in the Indian parliament. It explores the possibilities and limits of parliamentary democracy and the participation of women in its institutional performances. 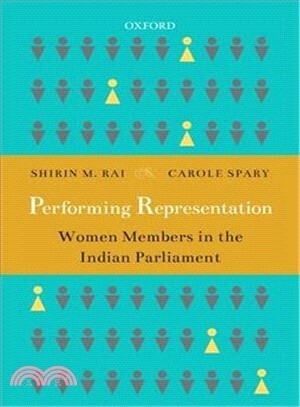 Offering a new, multi-method analysis of the gendered nature of India's parliament through an examination of electoral data, media reports and life stories of women Members of Parliament it sheds light on the performance, aesthetics, and norms of parliamentary life. It explores how the gendered axis of power underpins the performance of parliament and its Members as well as the political economy in which they are embedded. The book makes a strong case for taking parliamentary politics seriously in these times of populism, without either a utopian framing of women MPs as challengers of masculinised institutional politics or seeing them simply as docile actors in a gendered institution. Performing Representation raises critical questions about the politics of difference, claim-making, representation and intersectionality. It addresses these questions as part of global feminist debates on the importance of the women's representation in political institutions. Professor, Department of International Studies, Monash University (2014-) and Ford Visiting Professor at Jawaharlal Nehru University, New Delhi. She has a PhD from University of Cambridge. special issues of the journals Democratisation and Contemporary South Asia. She was the convenor of the Politics of South Asia Specialist Group of the UK's Political Studies Association from 2008-2016, and is the Deputy Director of the Institute of Asia and Pacific Studies, at the University of Nottingham. She has a PhD from the University of Bristol.